Kobe. Laid down at Mitsubishi Zosensho. Launched and named HOZU. .
Reassembled and completed at Yangtze Engineering Co. Hangkow. HOZU departs heading up river. Hankow. British insect class river gunboat HMS COCKCHAFER is at anchor. At 0545, her crew logs that she is passed by IJN HOZU heading up river. Ichang (now Yichang), China. HMS COCKCHAFER anchors accompanied by gunboat HMS CRICKET. HOZU's captain pays a courtesy visit to HMS COCKCHAFER. At 1400, HOZU is visited in turn by HMS COCKCHAFER’s captain. LtCdr (later Rear Admiral) Hori Yugoro (41) is appointed CO.
LtCdr (later Vice Admiral) Kamata Michiaki (39) is appointed CO.
An unknown officer is appointed CO.
Liutiaohu, about 25 miles from Mukden (now Shenyang), the capital of Manchuria. Japanese soldiers detonate an explosive on the Japanese-owned Southern Manchurian Railway. Chinese soldiers retaliate with gunfire. The Japanese Kwantung Army reinforces their troops and settles the conflict. The Japanese continue N to Mukden, attack the city and win control the next day. The “Mukden Incident” is the beginning of the Pacific War. LtCdr (later Rear Admiral) Nagai Mitsuru (45) is appointed CO.
LtCdr (later Rear Admiral) Nakatsu Seiki (44)) is appointed CO.
Hun River, Lukuokiao (Peking), China. Japanese troops at the bridge fire blank cartridges during night maneuvers. Chinese troops fire back. Later, the Japanese discover a soldier missing. They demand entry to the Peking (Beijing) suburb of Wanping to look for him, but the Chinese refuse. The Japanese shell the city and an undeclared war on China begins. Japanese residents in the Yangtze River area are guarded by Rear Admiral (later Vice Admiral) Tanimoto Umataro’s (35) 11th Gunboat Division composed of flagship minelayer YAEYAMA, HOZU, river gunboats FUTAMI and KOTAKA and a detachment of 292 troops of the Shanghai Special Naval Landing Unit, all based at Hankow. The Japanese capture the ancient Imperial Chinese capital of Peking (now Beijing). The 11th Gunboat Division evacuates Japanese civilians from the interior to Shanghai. Shanghai. At 0900, more than 10,000 Japanese troops enter the suburbs. Fighting begins in the Zhabei, Wusong and Jiangwan districts. ATAKA and the 11th Gunboat Division put ashore Special Naval Landing Force (SNLF) reinforcements. At 1600, warships of Vice Admiral (later Admiral) Hasegawa Kiyoshi’s (31)(former CO of NAGATO) 3rd Fleet in the Huangpu (Whangpoa) and Yangtze Rivers begin bombarding Chinese shore positions. Shanghai. Flagship USS AUGUSTA (CA-31), carrying Admiral Harry E. Yarnell (former CO of SARATOGA, CV-3), CINC, U.S. Asiatic Fleet, arrives from Tsingtao and anchors in the Huangpu River. That same day, the Chinese Air Force (CAF), under retired Captain (later LtGen) Claire L. Chennault, launches aircraft to attack IJN flagship IZUMO and the Japanese fleet. The CAF mistakenly bombs British cruiser HMS CUMBERLAND, but their bombs fall wide. Two bombs also fall close alongside AUGUSTA, but no one is killed. Other CAF fliers also bomb Shanghai city, killing more than 1,700 civilians and wounding 1800 others. In view of the increasing danger, it is decided to repatriate Shanghai’s Japanese women and children. About 20,000 of the total 30,000 residents are successively returned home. 50 km NE of Shanghai. The IJN lands General Matsui Iwane's 3rd, 8th, and 11th Divisions at Chuanshakou, Shizilin, and Baoshan under the cover of the 3rd Fleet's guns. The IJN also makes other large-scale landings of Matsui's troops at Liuhe, Wusong and Chuanshakou. Chinese troops begin withdrawl from parts of Shanghai. S of Shanghai. The IJN lands the IJA 10th Army in Jinshanwei, nearly unopposed. On 8 November, Generalissimo Chiang Kai-shek issues an order for a general retreat. By 12 November, Shanghai is cleared of Chinese troops. On 26 November, the Chinese Army fall backs to the capital of Nanjing (Nanking); thus the battle for Shanghai lasted three months. Rear Admiral (later Vice Admiral) Kondo Eijiro (36)(former CO of KAGA) is appointed CO of the 11th Gunboat Division. 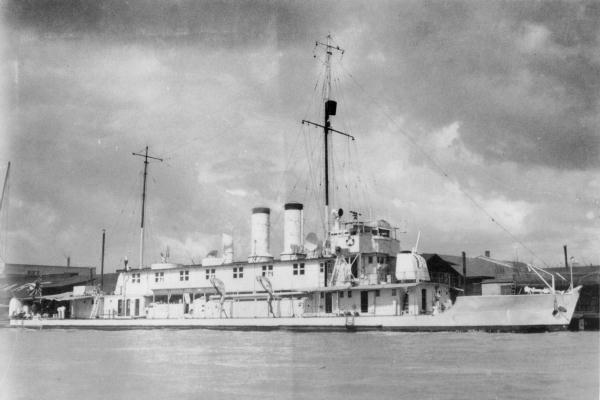 The 11th Gunboat Division heads to Xiaguan led by gunboat ATAKA. The division returns fire against blistering attacks from Liu Zijiang’s trenches. HOZU and gunboat SETA are in front and ATAKA, gunboat HIRA and main force destroyers KAWAKAZE and SUZUKAZE follow. The Yangtze River and its riversides are full of routed Chinese boats and rafts. Each gunboat attacks them. Cdr (later Rear Admiral) Kawano Yasushi (47) is appointed CO. Attached to the First China Expeditionary Fleet, China Area Fleet. Attached to the Yangtze Special Base Force, China Area Fleet. HOZU and sister HIRA are attached to the Yangtze Special Base Force’s 22nd Gunboat Division. Yangtze River. HOZU and HIRA run aground in shallow water near Anking. Chinese planes bomb and sink HOZU and severely damage HIRA near Anking at about 30-30N, 117-00E. Because the draft of this type of boat is so shallow, even when the seas were a little high, there was a great danger of turning over, so it was transported disassembled and re-assembled at its operating locale. Thanks go to Matthew Jones for help in identifying COs. Thanks also go to reader Dorbel for info on HMS COCKCHAFER in Rev 1.